Since when did urinating in public—in broad daylight—become okay? If it seems that I’m a bit obsessed with the art of peeing in Belgium, it’s because the entire tourism industry hinges upon the Mannqen-Pis. And because in Brussels, a public event (such as the free concert to celebrate Belgium’s assumption of the European Union’s rotating presidency) boasts not only portable toilets but portable urinals. Who knew? Unfortunately, there are some things in life that one should not photograph, and dozens of men gathered around miniature towers of gray plastic just outside of the European Parliament qualifies as one such thing. I don’t want to give the wrong impression. Overall, Belgium is a very civilized country complete with buses, trams, a suitable metro and the Villo! (its answer to the Velo’V) although the last of these hasn’t really caught on yet. 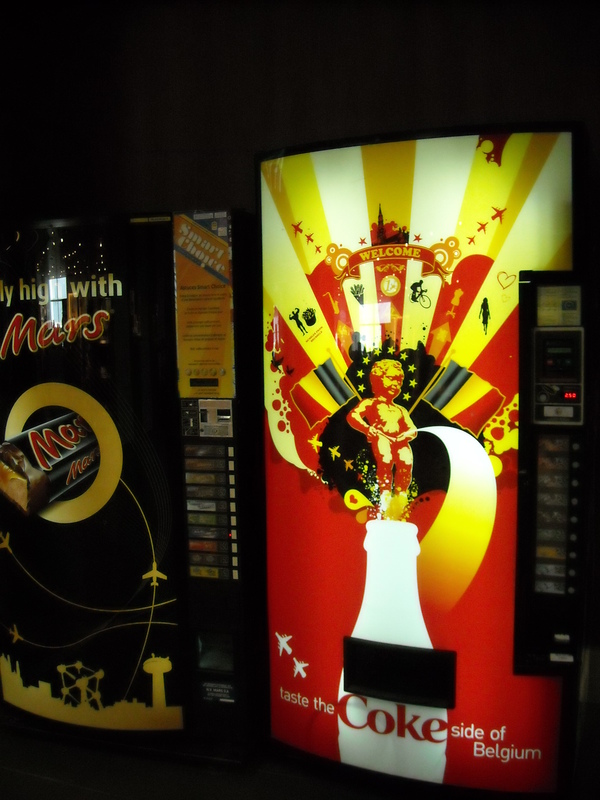 Only in Brussels can you find a Neahaus, a Godiva and a Pierre Marcolini on the same corner (and only Marcolini would have a collection called “Ephemeral” and a line called “Conspiration” and yes, I am talking about chocolate once again). 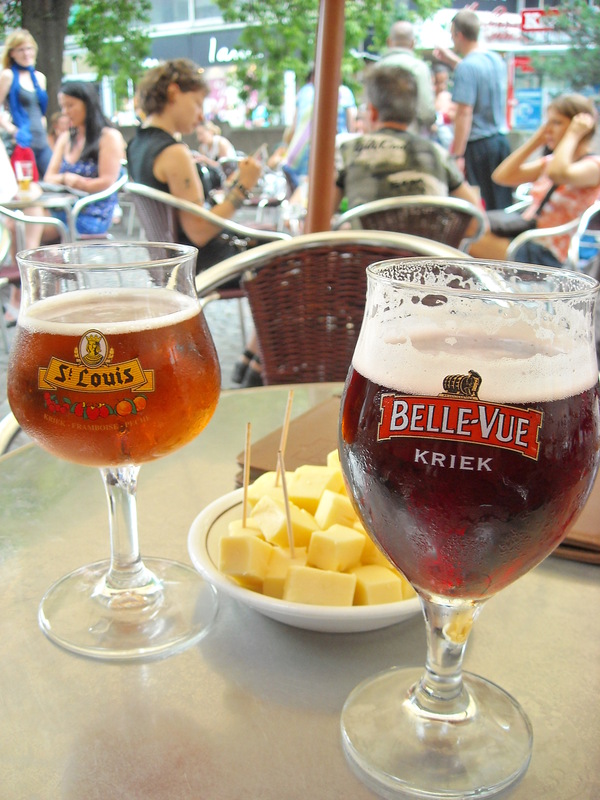 Only in Belgium can you order girlie, fruity beers and not feel like an idiot (at least I did not feel like and idiot when I sat down to enjoy a cherry-flavored Belle-Vue Kriek after braving the “Soldes” of Rue Neuve with my hostess. “Soldes,” you see, are sales, and with an H&M every twenty feet, the denizens of Brussels were out in droves. My hostess warned me to brace myself for Bershka: “It’s like Primark and TigerTiger combined.” For those of you unfamiliar with London nightlight and the horrors of Oxford St. on a Saturday morning, imagine the Walmart in South Philadelphia with a DJ; now replace all of the slightly normal clothing with pleather “playsuits,” neon leggings and sequined tank tops, knock 75% of these items off their racks and onto the floor and you’ve got Bershka’s during the soldes). Nonetheless, I love my Belgian beer. Actually, I love every beer my Belgian hostess has ever convinced me to try, especially those with fruit involved. I’d say I was well on my way to becoming a beer connoisseur except for the fact that I was amazed—simply amazed—that proper Belgian bars serve beer in glasses that correspond to their contents. “My glass says Kriek on it!” I exclaimed. “Of course,” she replied, flourishing her peach St. Louis in a St. Louis glass. Sure enough, the man at the next table, who was drinking Chimay had a glass that said Chimay. The woman drinking Stella had a glass that said Stella Artois. “My flat mate used to drink Stella out of a can,” I lamented. My hostess just shook her head. Evidently one who associates with boys who drink Stella from a can (and spent ten minutes gaping in wide-eyed fascination at the spoils on offer at de Bier Tempel) has a lot to learn about beer. Chocolate, however, is a different story. My hostess’s mother prepared a lovely dinner—the loveliest I’ve had since coming abroad—on Friday night, complete with melon and prosciutto, a spinach salad, fish and a six course dessert. Diligent travel writer and gracious houseguest that I am, I made sure to avail myself of all six courses: fresh strawberries, a raspberry tart, a chocolate éclair, a little chocolate cake topped with a cappuccino flavored macaroon (which, in an unusual display of self-restraint, I split with my former flat mate) a small, individual-sized square of Cote d’Or dark chocolate and a small but not-so-obviously-individually-sized “tablet” (because “tablet” sounds somehow more sophisticated than bar) of Citron Gingembre . The Citron Gingembre was, without a doubt, the most heavenly chocolate I have ever tasted. I awoke on Saturday with one and only one thought in mind: to find the little lemon ginger tablets and purchase as many as my suitcase could hold. That and tour La maison du chocolat. For a bit of variety. La maison, unfortunately, left a bit to be desired. They give you a little cookie dipped in chocolate when you buy your ticket but it was milk chocolate, and we all know how I feel about milk chocolate. Also, the cookie was stale. The collections themselves centered upon a large dug out canoe and a collection of tins featuring photographs of the Belgian royal family. The demonstration, if you can call it that, featured a pubescent looking “chocolate master” and a collection of three rather terrifying chocolate “teddies.” I did learn a thing or two about how to make pralines (the European kind, not the candy-coated pecans of New Orleans) but I don’t think I’ll be launching my own line of “ephemeral conspirations” any time soon. Fortunately, the local grocery store made up for all that La maison du chocolat lacked. Picture Walmart again. A super Walmart, actually, and not a particularly nice one, just so you can get an idea of the average Belgian super market. I’m not talking Corné or any of the fancy Chocolatier artisanal shops which line the Galeries Royales or the streets of the Sablon, just your regular, run of mill supermarket. Picture an end cap of Kinder Bueno—child’s play chocolate—but as you round the corner, to find yourself surrounded by chocolate on both sides, close your eyes and thank God you’ve only a day left in Brussels, because you’ll have gained ten pounds by the time you return to London if you stay much longer. Beware. There are crazy American tourists in the chocolate aisle. Some, like the international students we encountered from Delaware, are so shocked by the nirvana-like experience of the Belgian supermarket that they just stand there blithering “Avocado chocolate? Thyme? Lavender?” They can’t count their Euros fast enough. Others, having gone at least forty five minutes since their last fix, scour the shelves like ravenous wolves. Their cries of, “Lemon ginger! Lemon ginger! Where’s the lemon ginger?” echo through the aisles. Sometimes, when they at last find the long-coveted Cote D’Or Citron Gingembre (and a coupon to boot! 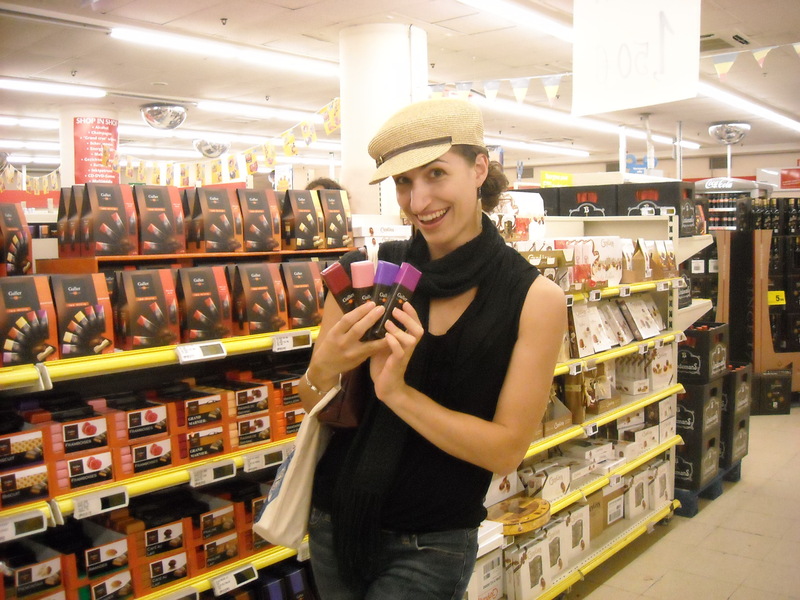 ), they get so excited that they forget this is a regular Belgian supermarket, not a tourist attraction, and they subject their poor hostess to ten minutes of photographing chocolate. Don’t get your hopes up for the lavender though- it was only available in milk chocolate and I know how we Richer women feel about milk chocolate. The thing I miss most about Europe (now that I go to college in Boston, USA) is our love of exquisite food! The Spanish make eating a social event, the Germans turn it into an occasion for celebration, and the French treat it as art! In the States, it’s all either junk or organic: depending on the marketing strategy of the brand; and I’m equally fed up with both extremes. 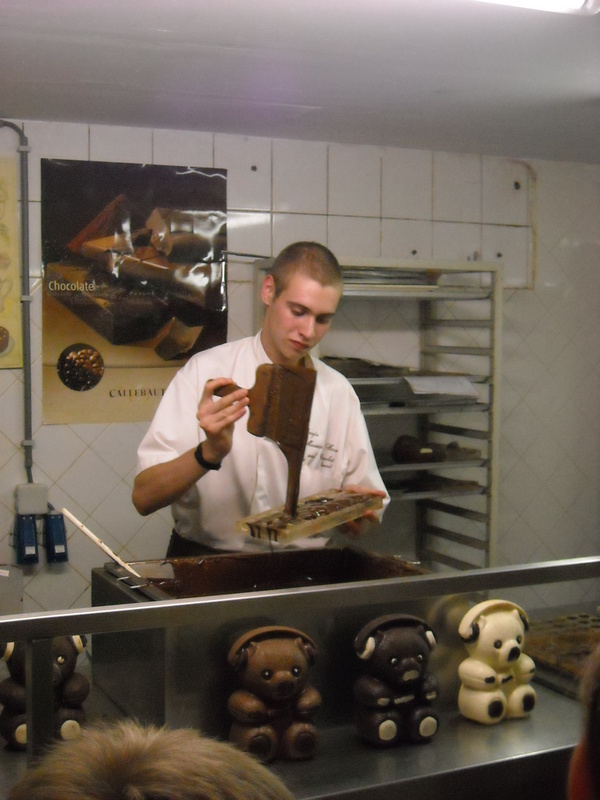 I also miss being able to sit down in a restaurant with friends for a couple of hours and enjoy a several-meal course with different types of wine for each course; or to buy fine chocolate and premium beer in stores… and just being able to find good Belgian chocolate! I know I’m about 6 months late on this and all but I’m a newish vistor who is doing a proper background check to ensure i do like what i read, and not just one or two posts. Dont worry it’s not stalking or anything, its research, I promise. It cant be stalking if i told you about it right? Alas, I digress.